but... I often find something that I like at a restaurant and then I order it every.single.time. I know what I like, people!! One of the things I love most about the panang curry at the restaurant is how gigantic the shrimp are. 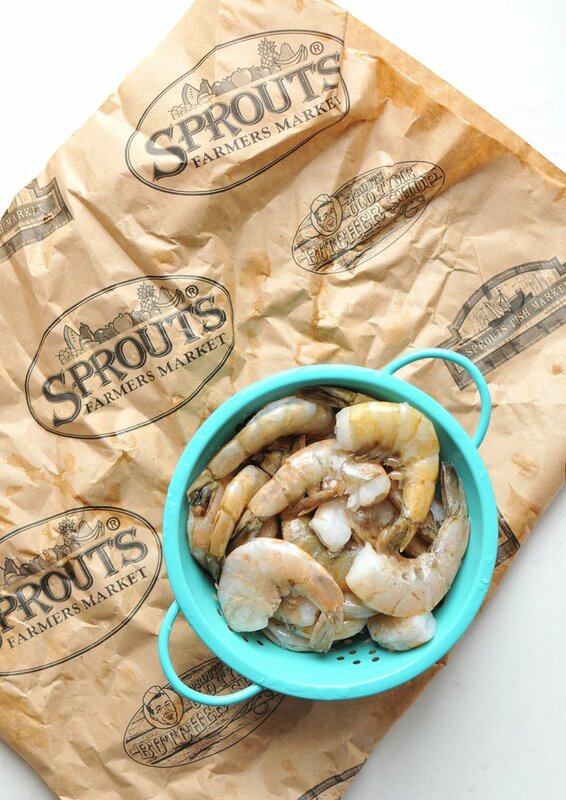 That's where these colossal wild-caught shrimp from Sprouts come in. 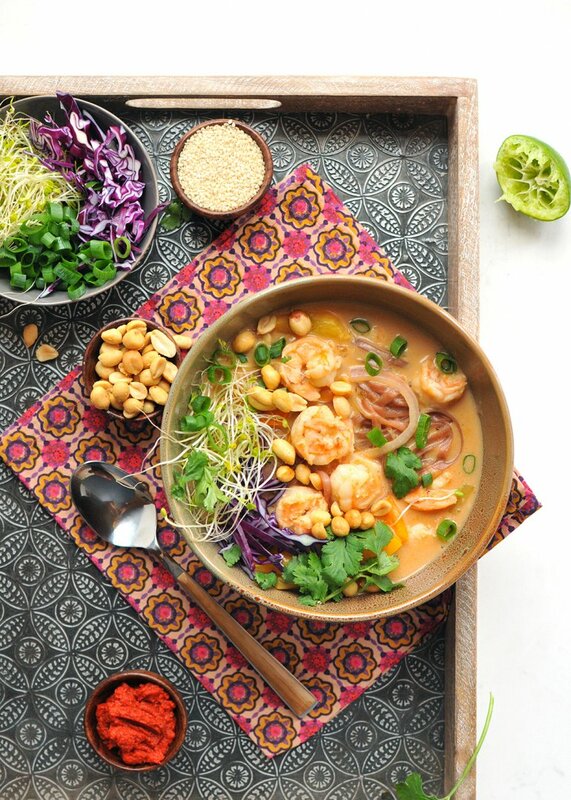 Panang (or phanaeng) curry is a special variation of Thai red curry paste that has a sweet and salty, nutty flavor. It is actually fairly difficult to find in regular stores, so I just made my own version using regular red curry paste plus powdered peanut butter (one of my favorite things) and other flavors. And it was perfection. And the fun part? Topping it with alllllllllllllll the good things: red cabbage, broccoli sprouts, cilantro, sesame seeds, green onions, and peanuts! Rinse, peel, and de-vein all of the shrimp. Then, put them in a medium mixing bowl. Stir in 1 Tbsp. olive oil and the minced garlic and ginger. Let marinate for 10 minutes. Meanwhile, in a large deep skillet /pan, heat up the remaining 1 Tbsp. olive oil over medium heat. Then, saute the bell peppers and red onion for approximately five minutes until softened and lightly browned. Add in the sauce ingredients: lime, water, coconut milk, powdered peanut butter, oyster sauce, curry paste, coconut sugar and soy sauce. Bring back to a boil. Once the sauce is boiling, stir in the shrimp and rice noodles. 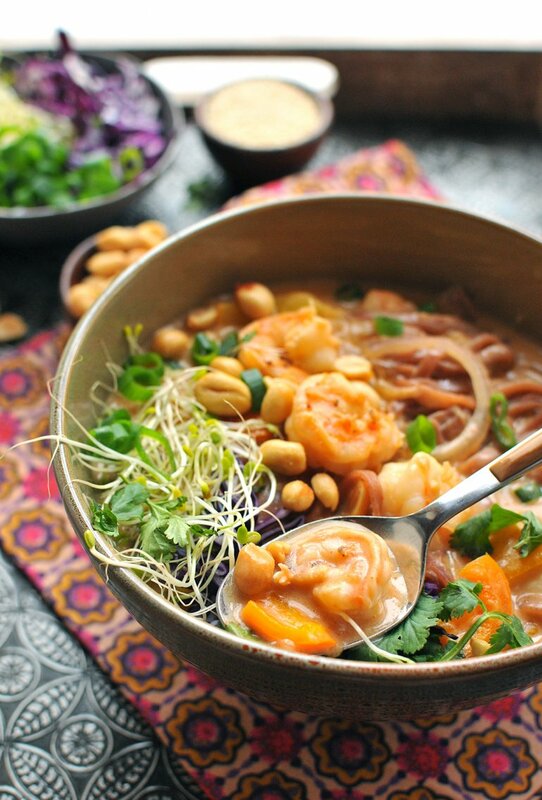 Stir frequently while the shrimp cooks and the noodles soften, for approximately five minutes. Shrimp should be opaque and noodles should be soft. 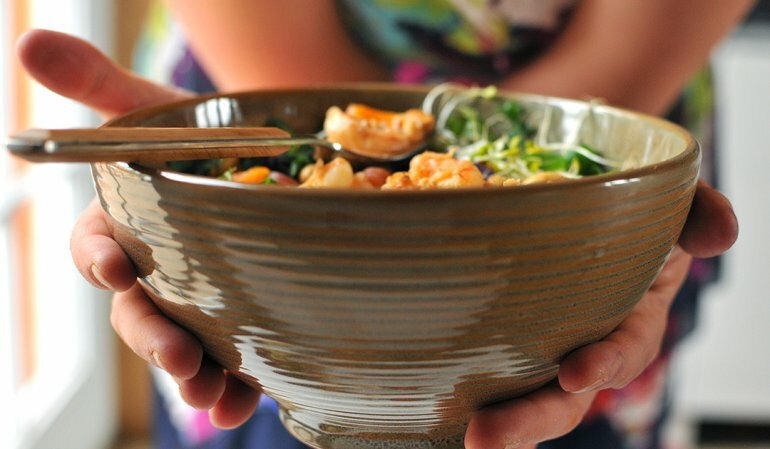 Serve in a large noodle bowl and add the garnishes: green onion, cilantro, clover sprouts, red cabbage and peanuts.